Joint research between CDMPS and CSDILA, has recently explored specific connections between the UN Sustainable Development Goals (SDGs) and disaster management. The global adoption of the United Nations (UN) Sustainable Development Goals (SDGs) and the Sendai Framework for Disaster Risk Reduction, as well as the establishment of their general inter-relationship, has brought greater awareness to the critical significance of prioritising disaster preparedness and resilience to support countries and communities in their efforts to support sustainable development. With evolving hazard landscapes, including the intensification of disaster frequency and global impact, progressing sustainability is dependent on defining the specific linkages between priority research areas in disaster management and the individual SDGs. 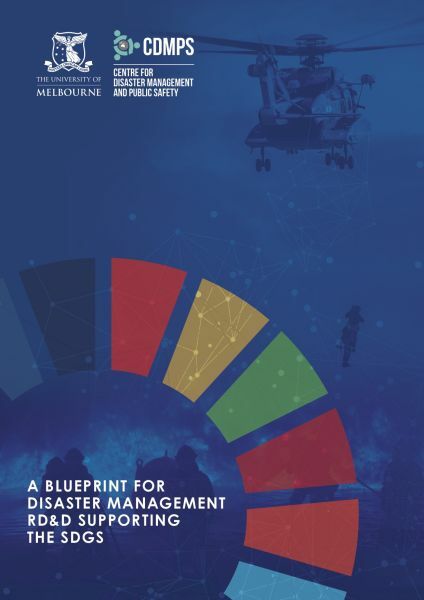 This Blueprint presents the Sustainable Disaster Management Framework that establishes the detailed relationship between disaster management and the SDGs to guide future research, policy and innovation for sustainable development and disaster risk reduction. The framework outlines the steps necessary to answer the question “How can we translate our research into consistent and executable strategies that overcome disaster risks and sustainable development challenges cohesively?” In addition, the framework encourages effective partnerships and guides researchers to a comprehensive integration of the SDGs in disaster-research initiatives. The Blueprint was initially announced at the 'The SDGs Connectivity Dilemma: Urban Settlements, Resilience, and Sustainability' forum as part of the 8th UN-GGIM Expert Committee meeting at the UN Headquarters in New York. Following this event, we hosted an International Symposium 'A Smart Sustainable Future For All- Enhancing Resilience in a Changing Landscape', in co-partnership with The World Bank (the Global Facility for Disaster Reduction and Recovery and the Social, Urban, Rural and Resilience Global Practice) where we launched the Blueprint.